Lost Levels :: View topic - I want your old video game magazines, newsletters, etc. Lost Levels - A website about unreleased video games. 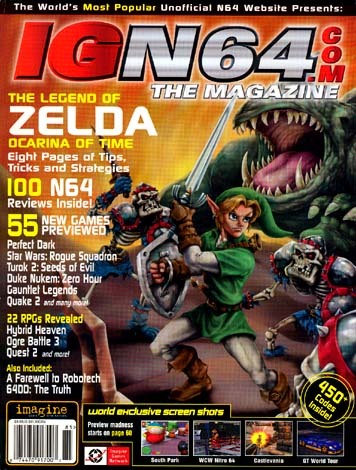 I want your old video game magazines, newsletters, etc. What is there about Quest 2 ? 22 RPGs for N64 ??? They were being a bit, shall we say, generous in their definition of RPG. I'm pretty sure Frank has that issue now, so he's the one to ask about it. From what I remember, there wasn't much information on Quest 2. One thing it does have is a sidebar about canceled Nintendo 64 games. I think it quotes someone as saying Freak Boy is "the best game you'll never play." I don't know if you'd even be able to stretch the definition of an RPG far enough to list 22 released N64 games. Well, it doesn't fit the way it used to, for sure! on a sort-of related note, does anyone happen to have or know of any magazine that mentions the Color Gamate system? Supposedly it was exhibited at CES or some other trade show, and reported in a US magazine at the time. Some sources mention it being shown alongside the TurboExpress, so 1990ish .. which is kinda weird, considering the B&W model was only released in 1990, but the Gamate is a weird console in general. EGM 9 has something about the TurboExpress on its cover, so it could be that one I guess (or something else from around the same time). I'm pretty sure VG&CE had a review of the system and games in an issue, along with wondering if it would really have any success. edit: Actually, I don't think it was color. So, not what you're asking for. Oops. edit 2: I'm starting to think it was a different system they reviewed.. wish I had scans of VG&CE. Yeah, I'm just trying to find out if there's any truth in the rumours of a colour version. I'd still be interested in any coverage of the B&W one though - all I've seen so far is this and one article that's considerably more in-depth but also in Chinese. I can 100% confirm that it was not shown at either CES in 1990 (both of which had the TurboExpress), I have studied both shows to an insane degree! Either that or no magazine in the U.S. or U.K. picked up on it for some reason, which is kind of impossible. Ah, that's a shame. I did think it was pretty unlikely that they'd show it either before or so soon after the release of the B&W version .. I wonder if it was a different show, or if someone just made it up. Bionic Commando is probably an arcade screenshot. Karate Kid and Jaws are probably mockups. Zelda is an FDS version shot (different font). I think the Karate Kid screen was actually confirmed to be a mockup by somebody involved with it, please correct me if I'm wrong. Bionic Commando is not an arcade shot. It actually looks like Turrican on Amiga. That's what I thought at first, but then I checked around and realized that there's a huge armored robot-thing in the background of one level in the arcade Bionic Commando. That screen fits it closely. There's a shot of the level in question halfway through the writeup about the arcade game. I have another round of game magazines to ditch. I'll use the same rules as before: You pay only for shipping, and a $10.70 flat-rate box from the USPS holds 10 to 20 magazines. So you can pick what you want and pay $11 per box. Inside one of them is a Game Genie code for "Werewolf the Last Warrior" that is not online. I remember from my childhood that it had a bunch of X,W or Zs in it. If you'd pot it here id be eternally grateful. I'm been hunting for it for years.